Toni joined the Interlaken team in January 2006. Originally from Philadelphia, PA, she has actively been involved in camping and informal Jewish education since she was a camper at JCC Camp Arthur-Reeta. 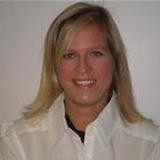 Toni has a Bachelor of Science degree in Business Administration from the University of Florida and a Master of Arts in Jewish Professional Studies from the the Spertus Institute of Jewish Learning and Leadership. 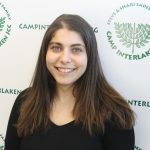 Prior to working at Camp Interlaken, Toni was the Assistant Director of House in the Wood Camp serving inner-city Chicago children, the Sales & Operations Manager of Camp CHI’s Perlstein Resort & Conference Center, and a Software Engineer with two major technology consulting firms. In 2007, Toni was selected as one of 12 resident camp directors to be a Mandel Senior Fellow in the Lekhu Lakhem program through the JCC Association’s Mandel Center for Jewish Education. Toni has been active with the Wisconsin and Illinois sections of the American Camp Association and with the Midwest Jewish Camp Directors. She has been on the board of the National Council of Jewish Women – Milwaukee Chapter. Toni is an avid public speaker who has delivered trainings and talks as a part of the Professional Development team at the JCC in Milwaukee as well as Gan Ami Early Childhood, American Camp Association, and Foundation for Jewish Camp. Toni lives in Milwaukee, Wisconsin with her husband Jonah and her children Jaron (7) and Nava (4). Toni is looking forward to her 14th summer at Camp Interlaken. Mark’s Jewish summer camp experience started when he was a lifetime camper at Shwayder Camp in Colorado. Since 2006, Mark hasn’t missed a summer of Jewish Camp. He held various leadership positions at Shwayder and URJ Camp George including CIT Director, Specialist Director and Program Director. 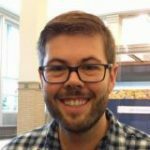 After receiving his degree in Human Development and Family Studies from Colorado State University in 2010, he continued to pursue his passion for informal Jewish education as the Youth Director at a Reform Synagogue outside of Boston. Mark joined the Interlaken family in 2017 after spending three years as the Director of Youth Engagement at Temple Rodef Shalom and the Assistant Director at Camp Rodef Shalom in Northern Virginia. Tova is an Interlaken lifer, and she is so excited to be back HOME as a part of the full time team! Tova spent 16 summers at Camp Interlaken as a camper, counselor, ozo, unit leader for almost every unit in Camp, and Mama Ozo in the summer of 2015. Tova received a BS in Recreation, Parks and Tourism with minors in Leadership and Non-Profit Management from the University of Florida (Go Gators). Before that, Tova worked for Disney as a Disney College Program participant for one year full time and two more years seasonally. Prior to moving back to Milwaukee, Tova was the Summer Camp and After School Director at Sun Country Sports Center in Gainesville, Florida. 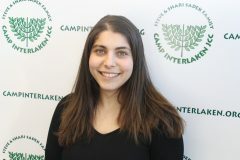 Beth joined the Camp Interlaken JCC family as the Camping Services Coordinator in 2008. She is the first point of contact as you come into or call the camp office. Beth graduated from the University of Wisconsin-Parkside with a BA in Communication. She joins us with a background in both business and education. Beth loves seeing our campers here at the JCC as well as when she and her family visit camp. Beth is married to Keith and the proud mom of Kelsie and Noah. Michelle has been a part of the Interlaken family since 2004. 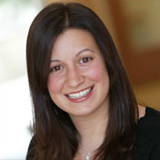 Michelle has been involved in Jewish camping since she was a camper at an overnight camp in Dingmans Ferry, PA. Michelle received her MSW from California State University – Long Beach and is a licensed clinical social worker. Michelle has practiced clinical social work for many years, including work in the Los Angeles County Probation Department and as the Director of a residential facility in Miami, FL. Michelle has been involved with the JCC since she moved to Milwaukee in 2000. Michelle first became active at the JCC as a young parent. She later became the Interfaith Outreach Coordinator and Camp Social Worker. Michelle is currently Gan Ami Pre-School Social Worker at the JCC in Milwaukee. She has three children, Shelby, Logan, and Tristan who are anxiously waiting for camp to start! Greg has been a part of the Interlaken team since 2008. Greg previously worked at Maryville Youth camps for 11 summers. He is a native of Chicago, IL. Greg lives in nearby Three Lakes and has 4 kids, Carly, Teagan, Ian, and Dane, each of whom have attended or worked at Camp Interlaken. During his free time Greg enjoys, snowmobiling, canoeing, and kayaking. He was recently received his Certified Pool Operator certificate and is always excited for summer at Camp Interlaken!